The Mycharge Amp2000 is a small convenient cylindrical battery pack that has the right balance of portable and power. 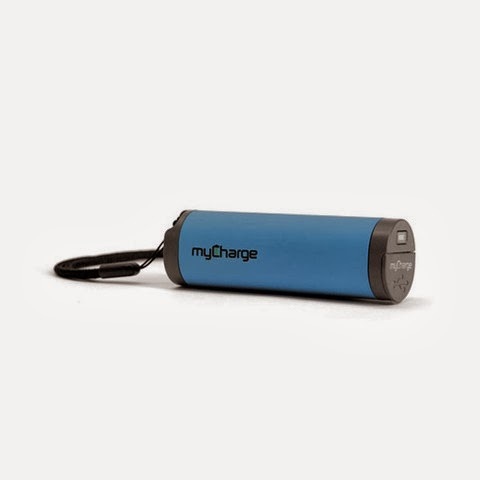 Measuring in at 1.3 x 1 x 3.9 inches and a soft rubberized finish on the outside this charger fits just about anywhere: your pocket, your glove compartment or your carry on giving you that extra boost of power with it’s 2000 mAh battery that can provide up to 9 hours of extra talk time. 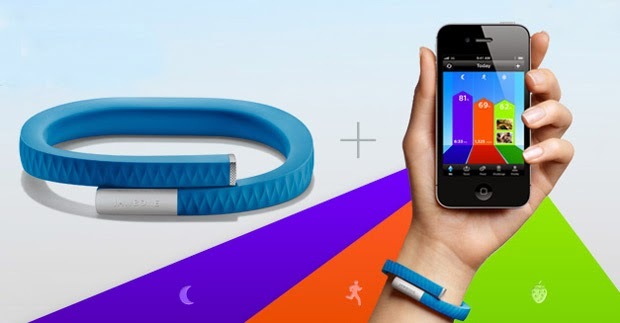 The package includes a micro usb cord for charging and the device has a standard USB Output of 1.0A for charging (bring your own charging cable). Also included is a lanyard that you can use to wear around your neck although I’m not sure why you’d want to do that. A nice easy power boost to get you through the day or an emergency! 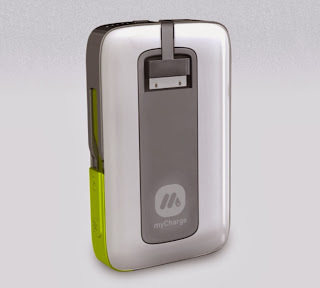 Mycharge.com calls this ““Swiss Army Knife of portable power devices,” and trademark issues aside they have it right on the money. 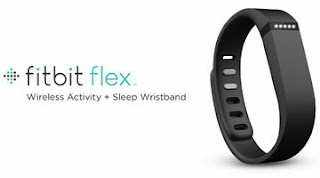 Starting off with this is a 6000mAh Lithium Ion battery providing up to 27 hours of talk time. A battery pack is simply a battery pack, expect when it’s a Hub charger. This device has a retractable micro-usb and an Apple compatible Lightning connector to charge most modern devices out there as well as a standard USB port to use older devices such as 30-pin or mini-usb cables. I’m disappointed the 30-pin wasn’t included but I understand Apple has discontinued that style. 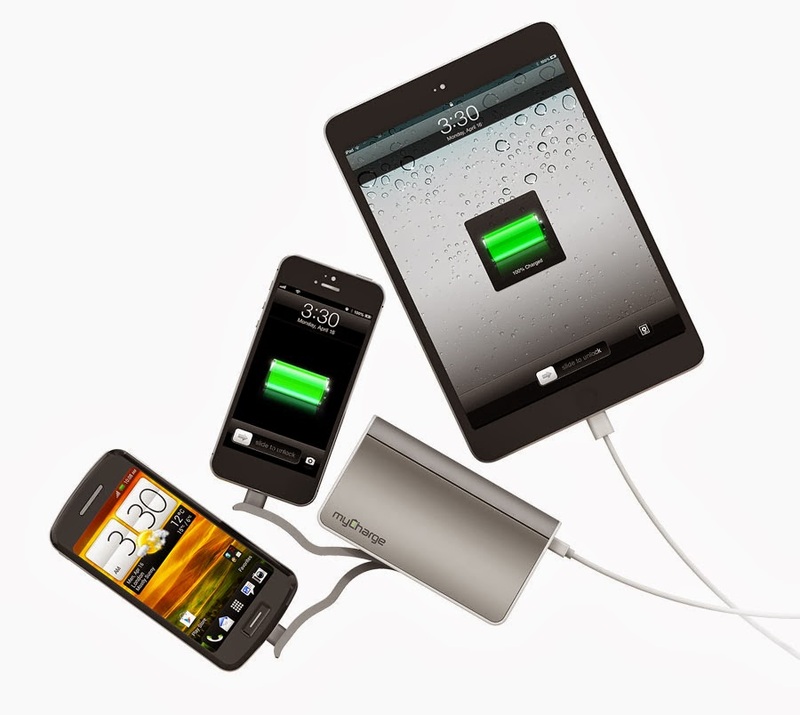 All three charging ports (usb, Lightning, Micro) can be used at once allowing you to charge three devices simultaneously. To charge the pack a retractable AC plug comes out and can plug into a wall and when not in use its well-hidden to prevent snagging. Aesthetically this device is a beauty and matches Apple’s design style with silver metallic base and white plastic edging (ok black would have been better) and with smooth edges it should easily fit in most backpacks, briefcases and carry ones. When traveling I can’t seem to get enough power but I absolutely despise filling up my carry on with a bunch of extra chargers and cables. While there are lots of chargers on the market, this one is as close to all in one as you get with retractable cables and AC adapter as well as a USB port and even an audible indicator telling you what is charging and how much charge is left. Due its somewhat large size it took up two wall plugins. Starting off, this has a powerful 6000mAH battery which according to specs provide up to 27 hours of talk time for your (the iPhone has a 1,400 mAH battery). The device has a built in 30 pin charger (see other products for Lightning adapter) and I can easily put my iPhone on top of the device and charge it without excess cable getting in the way. In addition to the 30-Pin there is a retractable micro-usb cable as well as a standard USB port and the beauty of this is all three can be used simultaneously so I can charge my phone and Bluetooth headphones at once. When you plug in a device, an audible alert tells you the device is charging and you can press a button to see how much charge is left in the battery as well as receive an audible indicator. At a quiet location (think library) this could be annoying but otherwise I found this a great feature because I knew it was working and could quickly tell how much battery is left. For travel this is the ultimate balance of power and convenience for users of Apple devices pre-iPhone 5 and iPads with Lightning chargers. If your primary goal is to charge Lightning devices you’d probably be better off with another product but for the rest of us in the 30 pin era this device rocks. 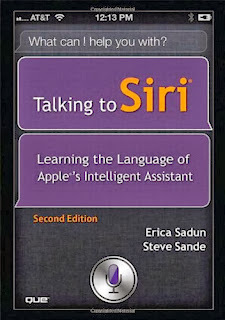 Too often computer books are written for either beginners or programmers. 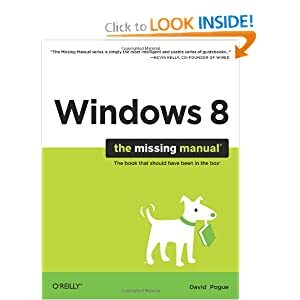 Very few intermediate books truly exists but this is the “just right” level for an experienced Mac user who wants to take his or her experience to the next level without learning programming or spending hours at a command prompt. This is the book for the rest of us who want just a little more from their daily experiences. 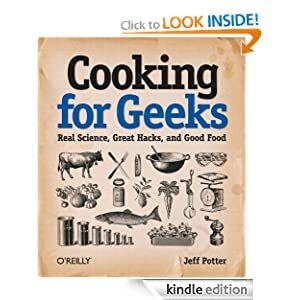 Instead of reading like a manual this book is in a “cookbook” style with various recipes you can try divided up into sections such as automation, productivity and security. Each recipe includes a justification for the project and tells you the very basics of how to do it primarily to help the reader reach that intermediate level. After establishing the basics, Cone suggests configurations and software to take it to the next level. The built-in functions of Spotlight are great, but programs such as Alfred build on that skill set and make your Mac usage experience extraordinary. I was initially skeptical, but pleasantly surprised by this book. I expected a series of simple tips and tricks I already knew or topics so advanced and complex that it simply wasn’t worth my time “trying” these ideas. 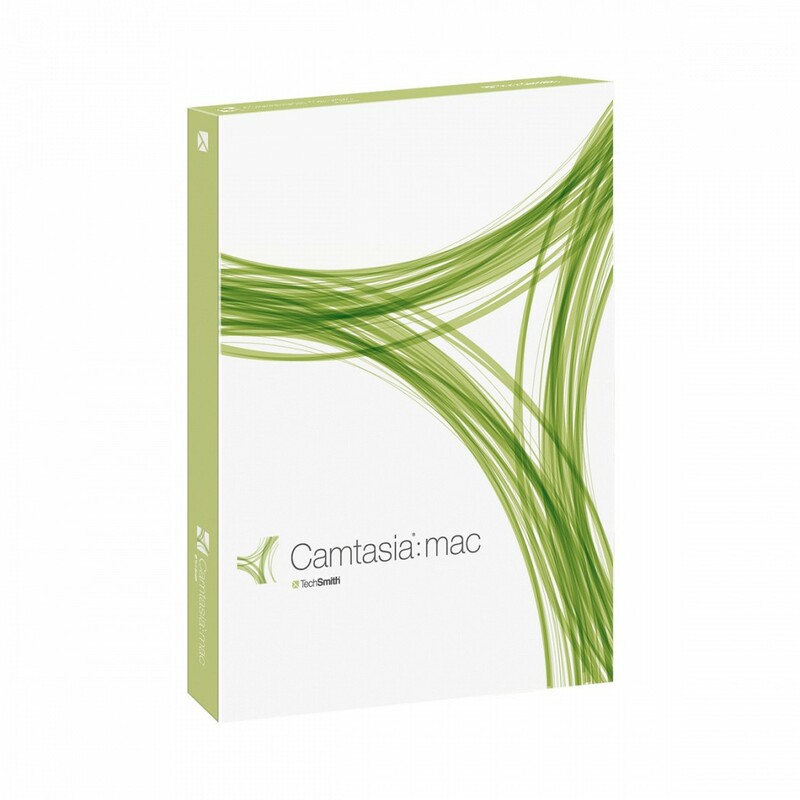 The book has a perfect balance of suggestions and project that can really enhance your Mac. Sure, I could research programs in the App store or online but this book curates all those thousands of programs into a series of basic ideas and solving of problems. Use your Mac with an external monitor? An entire chapter covers little things you can do to prevent annoyances such as knowing where your menu bar is or the annoying resizing of windows when you disconnect your monitor. 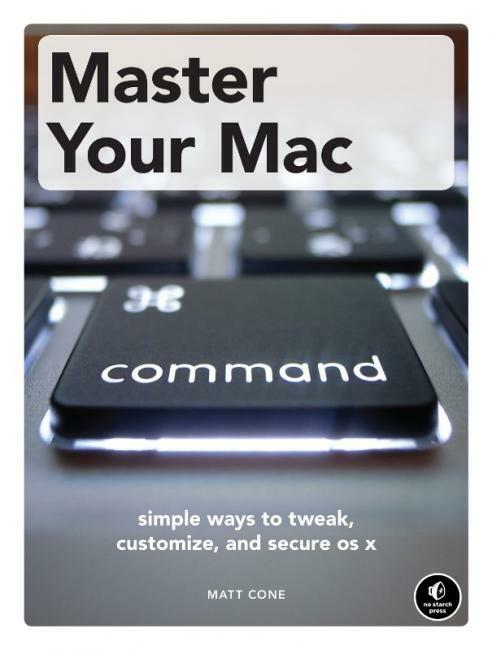 Experienced Mac users will benefit most from this book, but even beginners who simply want more will find a great series of ideas in this book. These chapters solve problems intermediate users experience and beginners haven’t quite hit the wall yet. One of the best books on the Mac I’ve read in recent years and makes a great gift for any Mac user that wants to be more productive and efficient without investing too much time or energy. Cons: The book quickly needs a version 2 because I finished the book wanting more of the same. The missing manual series consistently provides an excellent guide to every aspect of the program or product and this interation in the series is no exception. Since Wordpress is more of a service than an actual product, the author faced a unique challenge of making it relevant and useful without get stuck by the fact that Wordpress does frequent updates and tweaks to its products. The features were presented in such a way that they empowered the reader to understand the concept and not get caught up in the very detailed aspects of features that could change over time such as where an option is located or which menu to click on. This was less of a tutorial and exercise based book but rather an exhaustive feature guide that didn't get bogged down in overly technical aspects such as the nitty gritty of php or sql databases and was written from an end user perspective. The book mostly ignored fluffy discussions of why you should blog or what you should blog about and keep it all about setup, usage, and maintenance. The flow of the book assumes no prior knowledge of blogs hosted by Wordpress or self-hosted blogs and clear distinctions were made where applicable between the two versions. After reviewing setup and installation the book talks about how to enrich your blog with media, pages, and comments and then eventually going into the advanced concepts of plugins and multiple authors and then finally turning a blog into a full-fledged website which is all the rage today. This flow allows someone already familiar with how to setup Wordpress to pick up the book to start where the reader's individual skill set ended. Even though I am an experienced user of Wordpress, the sections on plugins and optimizing the use thereof was extremely helpful and the index was invaluable when I got stuck on a particular feature. Great book for someone who wants to move beyond simply writing a blog and work on taking ownership of it without paying a consultant or designer to do so.